Map of Suzhou Rail Transit showing various lines and stations. Click on the map to enlarge it or Download Suzhou Rail Transit map in PDF. 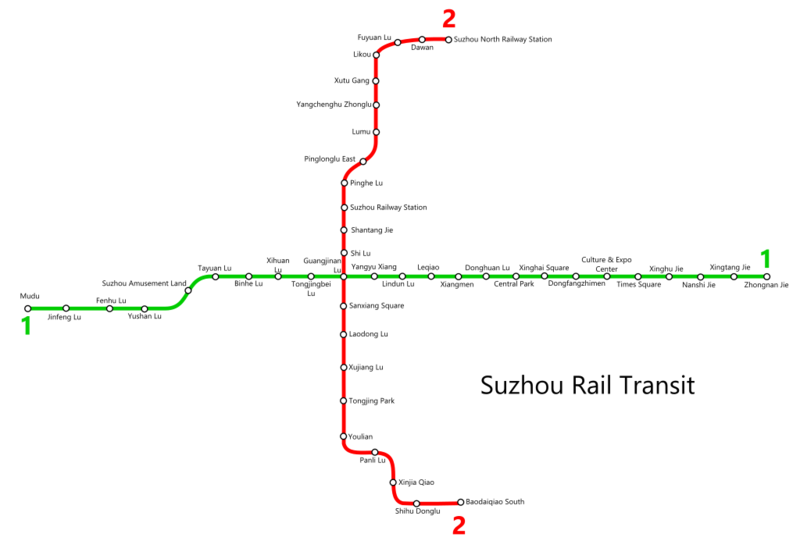 The Suzhou Rail Transit, or simply known as, the Suzhou subway is a relatively young metro network in the world. However, by 2020, if things go according to plan, this infant metro network, is set for big things. Currently, only 2 out of it’s 7 planned lines are in operation, spanning slightly over 50 km in length. Once all the 7 lines are completed, the length of the network will almost triple, to 140 km. The number of stations that it serves will also more than double. Presently, it serves 46 stations, but on completion of the entire project it will be serving 109 stations in total. The first line commenced operations in 2012, while the second line, began just a year later, in 2013. Despite it’s relatively limited reach, the metro network has a daily ridership of 373,000 (2015). The trains begin operations at around 06:00 am in the morning and they continue to run, till 23:00 pm. Their frequency however, is circumstantial. Based on the time of the day, the frequency of the trains vary. During the morning peak hours of, 07:00-09:00, the trains have a headway of slightly more than 5 minutes. In the evenings during the peak hours, the trains function at an even greater frequency, with one train arriving nearly every 4 minutes. At other times of the day, once every 6-7 minutes, a train arrives. In order to travel in Suzhou Rail Transit you need to shell out 2 yuan for the first 6 Km of your journey. For 6 – 16 Km one needs to pay 1 yuan additionally for each 5 km. For 16-20 km one needs to pay 1 yuan for each 7 km and for over 30 km one needs to pay 1 yuan for every 9 km. The maximum fare for Suzhou Rail Transit is 7 yuan and the minimum fare is 2 yuan. One can opt for Suzhou Tong to get five percent discount in each journey. Along with the conventional single tickets, there are other different types of tickets available to the passengers. For example, monthly passes, daily passes etc. Smoking is prohibited anywhere within the metro network. Some of the other things that aren’t allowed include, any kind of pet, flammable substances, bicycles, etc. It is advisable for the passengers to pay attention to the announcements made in the stations. These announcements are made for the benefit of the passengers itself. Providing utmost accessibility the metro offers escalator and elevator facilities for all. While using these facilities, certain rules need to be followed. These are basically general rules, aimed at helping the passengers. It was on April 28 in the year 2012 that services began on Line 1 of the Suzhou Metro. This route runs mostly along the east-west direction from the Zhongnan Jie Station in the Suzhou Industrial Park area to Mudu Station in the western limits of Suzhou City. The route is twenty-five kilometers in length and has twenty-four stations along the route. The commencement of operations for Line 2 began on 28th December, 2013. This line runs predominantly in a North-South direction traversing the length of the route up to Baodaiqiao South Station located nearby the Precious Belt Bridge in Wuzhong District from the northern terminal of Suzhou North Railway Station. At twenty-seven kilometers, it is longer than Line 1 but has lesser number of stations (twenty-two).